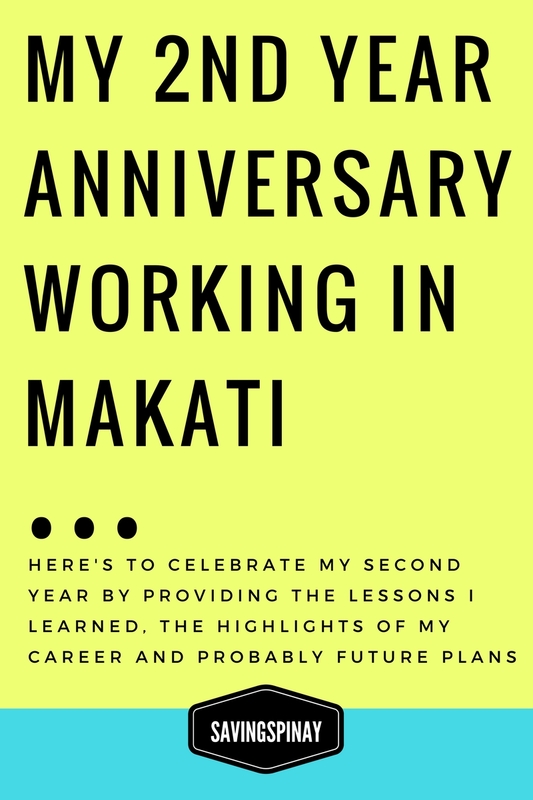 February 26 marks my 2nd year anniversary working in Makati. I can’t believe I will last this long in my current company considering how I easily used to things. I lasted only 1-3 months in my firs two jobs before I finally settled in my current work. READ: My Life, My Job, My Career and 6 Things that Helped Me Succeed. Today I will try to celebrate my second year by providing the lessons I learned, the highlights of my career and probably future plans. I hope with this post you’ll learn something. Over the last six months of 2015 I was going to work super late. I always blame the traffic or it’s just that I have bad luck commuting. Then 2016 came and one goal I made is to finally go to work on time ( I do this “No Late January, No Late February etc. tracker on My Bullet Journal). I realized that all it takes is discipline in how you use you time to be early at work. I didn’t have to do any magic. At the moment I seldom go to work late and if I do it will always fall in the grace period. My trick? I set an alarm in what time I have to go out of the house. I have the tendency outdo myself. I feel like I needed to do things on my own and have a hard time letting others know that I need help. Then realized that I have to stop being hard on myself. It is okay to let others know that I can’t do it. Hindi naman ako si Wonder Woman. I can’t be a martyr all the time. I can be a bit of a perfectionist sometimes with my kind of work. I don’t tolerate mistakes. I put a lot of pressure on myself to do my work right all the time. But then I realized that it’s okay to commit mistakes. There’s a lot of things that I have to improve in terms of what I do and I have to be an open cup…always ready to take knowledge from people around me. Currently we are in complete hiatus at work. There’s no concrete plan or even organization chart being released. Though I am still compensated well still it’s hard knowing how blurry the path ahead is. We have no idea what will happen to the company in 6-12 months. That’s why its important that you prepare yourself mentally, financially and emotionally. Whatever happens you need to be smart with your career decisions. Have enough savings ready and make sure that your emotions won’t affect your job at all times. I found the best people in the company that made such an impact in my life. Nica, our HR/Admin Representative whom I treasure the most as my bestfriend. Meeting Nica has been one of the best thing happened on my second year at work. We’ve been through a lot and I am excited on what else will happen. I want to be honest with you as my readers and I do feel a bit “50:50” whether I will be staying in my current work or not. I finally reached a point when I am not satisfied anymore on how things are going on in terms of the management. I feel like there’s no opportunity for growth anymore and I owe it to myself, my family and my future family to establish a better and surer career path. But I do love my WiFun Family and I have established memories and friends there so it’s really a tough decision on my part.